The road to 1000 total miles has been completed. It is 31 degrees today with winds of 11 knots. Normally Sunday is my rest day, but when I ran yesterday I found that I was .35 miles short of my 1000 mile goal after yesterday’s long run for the end of the year. So out I went this morning to complete the goal. Why not let it ride you ask? Well, one of the purposes of this blog is to keep track of the mileage. The way I look at it, it’s 13.1 miles in a half marathon not 12.5. If you’re going to do it ~ then complete to the best of your ability. There is a lot to be said about completion and seeing things through. It’s not necessarily how fast it was done, but that it was done. As you know this can be applied to almost anything in life. Running is just one of many vessels. I took the above photo this morning. From the photo it doesn’t look like a big hill, but it is steep and long. It has gravel and footing is not guaranteed. Just when you get to the top there’s another hill. It’s where my running journey began. It represents strength, determination, dedication to task, and importance of being humble. Running down this hill is what caused knee surgery in 2011, a little too sure of myself and going too quickly down a hill I wasn’t prepared or trained. The hill put me in my “place” if you will. Not like I had to be reminded, but there is always something greater and bigger than you out there. Now when I travel this path I have only walked down. Showing some respect and realizing the end goal or the completion of my 11315 task is greater than saying I ran down that hill (face intact)! It seemed fitting to end the year on this hill. I’m continuing to “mark” my shoes. The previous background picture on my blog, the shoes were new with no mileage. 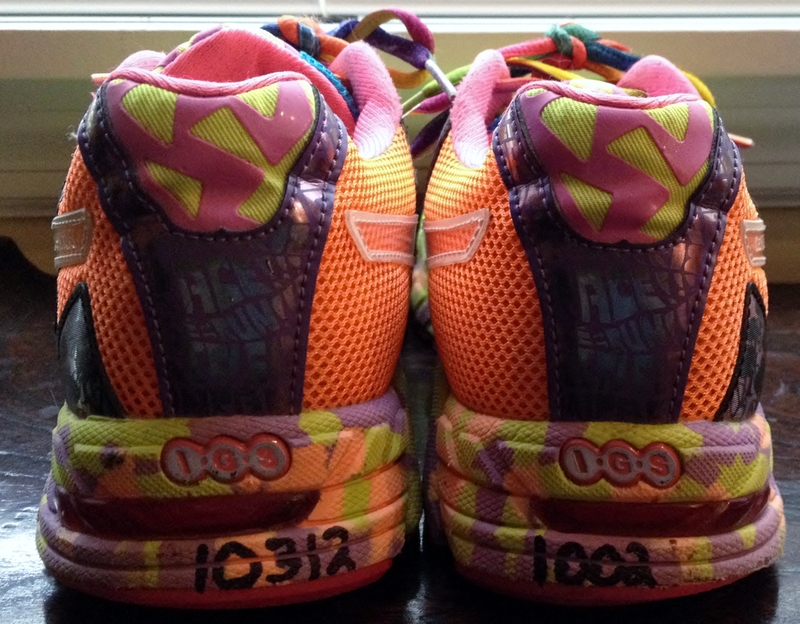 I’m happy to say I’ve reached my goal and now the shoes are turned inward with 500 miles marked on their “soles”. This entry was posted in December, December Mileage and tagged Inspiration, Motivation, Passion, Running, running mileage, Running mileage stats, Running Shoes, Strength, Thankfulness, Walking. Bookmark the permalink. Congrats on accomplishing 1000 miles! You did it! Mind me asking how often you replace your shoes? Thank you for the comment and follow! I make a point to change out my shoes every 500 miles. It makes all the difference and it’s not worth getting an injury over to squeeze out a couple more. I would love to hear your goals! All the best in 2014.